Pete Seeger died yesterday at the age of 94. He was at the forefront of the folk revival of the 1950s and '60s. His music influenced generations of fans and musicians including Bob Dylan and Bruce Springsteen. Seeger, who lived in Beacon, New York, was a life-long advocate for environmental causes including the health of the Hudson River. He helped organize Clearwater's Great Hudson River Revival - the annual festival that helps to preserve and protect the river. 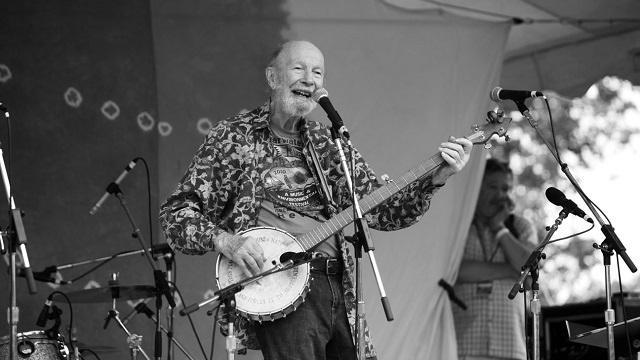 Lend your voice to the Question of the Day and suggest a song in remembrance of Pete Seeger. We'll spin a set after 9am. Pete Seeger "Waist Deep in the Big Muddy"
Peter, Paul & Mary "If I Had a Hammer (The Hammer Song)"
Jackson Browne & Bonnie Raitt "Kisses Sweeter Than Wine"
The Byrds "Turn! Turn! Turn!"